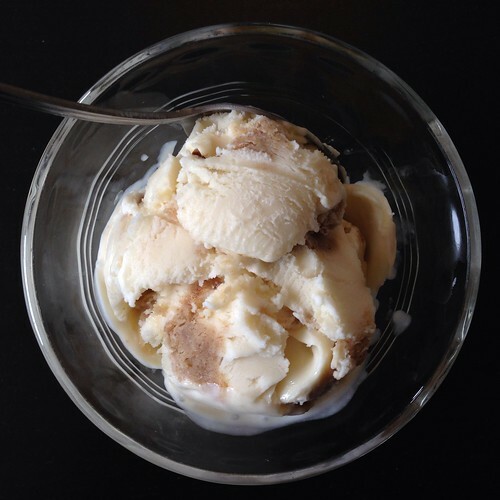 Häagen-Dazs had a contest years ago for fans to create a new flavor, and the winner was sticky toffee pudding. I was ecstatic because I absolutely loved sticky toffee pudding! I first had the dessert when I was in London. I don't even remember the name of the restaurant, but I remember totally falling in love with the warm, moist cake topped with a toffee caramel sauce and vanilla ice cream. Alas, the ice cream flavor was a limited edition, and even though I stocked up on it every chance I had, there came a long, dry spell during which I had no sticky toffee pudding ice cream. =( I sometimes thought about making it myself but never went through with it until recently when The Kitchn posted a recipe for making sticky toffee pudding sundaes. I just made a half recipe of the cake and sauce and combined it with a simple base ice cream from Jeni's Splendid Ice Creams enriched with a little vanilla extract. 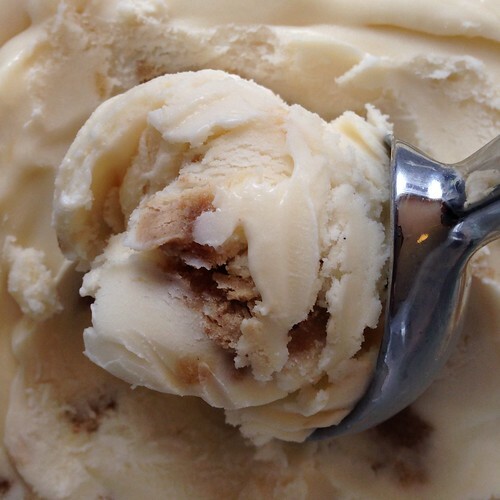 There was no point in making a gourmet vanilla ice cream with vanilla beans since all the nuances would have been lost under the stronger flavors from the sticky toffee pudding. Warning: this is not a quick and easy recipe. It involves reconstituting dried dates, baking a steamed cake, making a caramel sauce, and churning your own ice cream. Read through all the steps and make sure you have the time and equipment. I will say, however, that the results are oh so worth it! This tastes pretty much exactly like what I remember the Häagen-Dazs version tasted like! Combing the chopped dates and water in a small saucepan and bring to a boil. Remove from heat. Stir in the baking soda and let stand for 20 minutes to 2 hours. 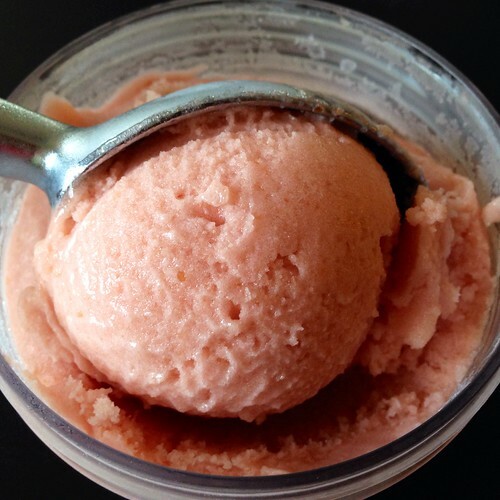 Transfer to a food processor or blender and process until mostly pureed. Preheat oven to 375°F. Generously grease the bottom and sides of a loaf pan with butter or baking spray. In the bowl of a stand mixer fitted with a paddle attachment (or with an electric mixer), cream together the butter and sugar on medium speed until light and fluffy, 3-5 minutes. Reduce speed to low and add the eggs one at a time, fully incorporating after each addition. Stop the mixer and scrape down the sides of the bowl. Whisk the dry ingredients together in a separate mixing bowl. On low speed, alternate adding the dry ingredients with the date mixture, beginning and ending with the dry ingredients. Stir in the vanilla extract. Pour the batter into the prepared pan. 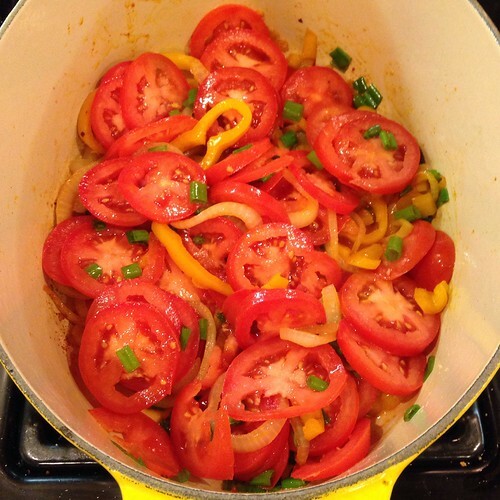 Place the pan inside a larger casserole dish or roasting pan and transfer to the oven. Pour enough hot water to reach halfway up the side of the loaf pan. Bake until a toothpick pricked into the middle comes out slightly moist, 30-35 minutes. When the cake has about 10 minutes left of cooking time, make the caramel sauce. Combine butter, sugar, and cream in a heavy saucepan. Whisking constantly, bring the mixture to a boil and cook for 3 minutes. Remove from the heat and whisk in rum (if using) and vanilla extract. Remove the cake from the oven and allow to cool for 5 minutes. Prick the cake all over with a skewer or toothpick. 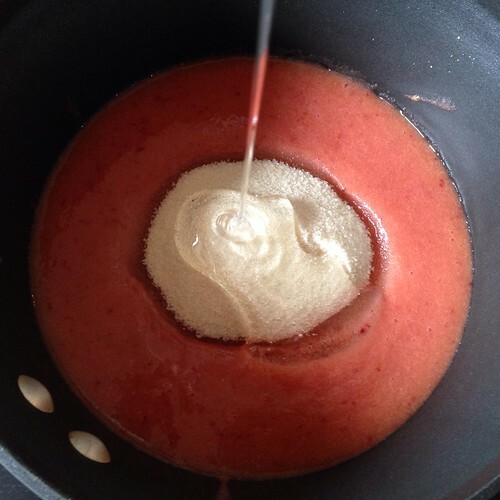 Pour half the sauce over the warm cake and let sit until it reaches room temperature. Cover and transfer to the refrigerator so that it can chill while you make the ice cream. 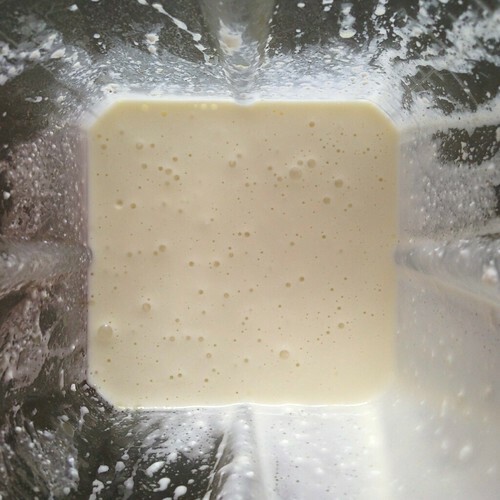 Mix about 2 tablespoons of the milk with the cornstarch in a small bowl to make a smooth slurry. Whisk the cream cheese and salt in a medium bowl until smooth. Combine the remaining milk, cream, sugar, and corn syrup in a 4-quart saucepan, bring to a rolling boil over medium-high heat, and boil for 4 minutes. Remove from heat and gradually whisk in the cornstarch slurry. Gradually whisk the hot milk mixture into the cream cheese until smooth. Stir in the vanilla extract and chill the mixture in the refrigerator. 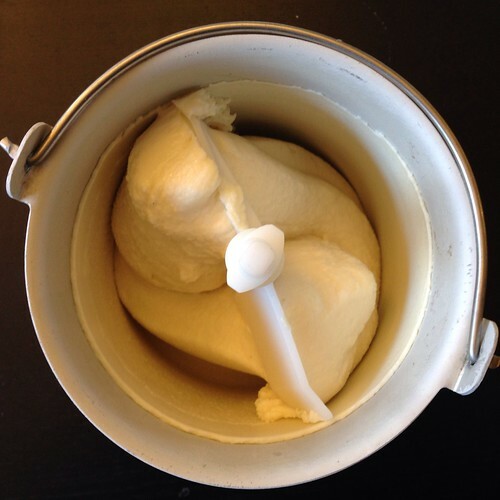 Pour the ice cream base into an ice cream maker and spin until thick and creamy. 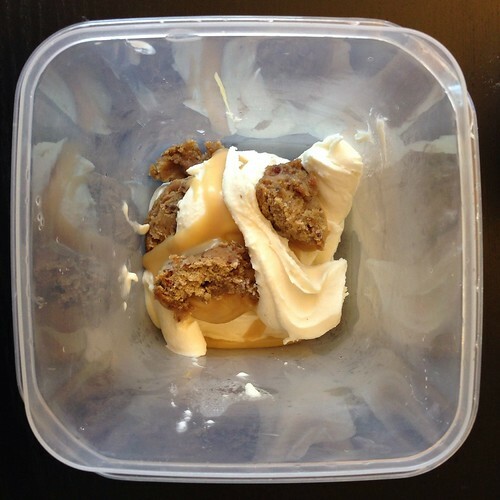 Pack the ice cream into a storage container, alternating it with layers of the cake and caramel sauce; do not mix. Seal with an airtight lid and freeze until firm, at least 4 hours. 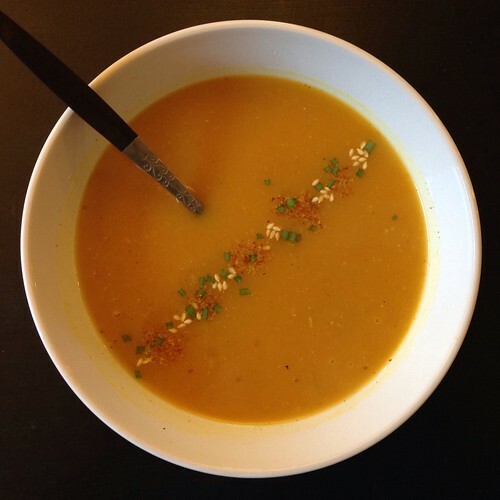 I've made this soup 3 times already, so I'm not really sure why it's taken so long for me to post about it. 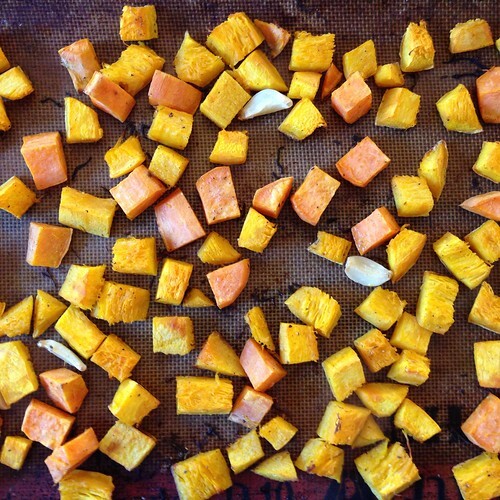 I first bookmarked this recipe from The Kitchn when I was trying to find ways to use up a sugar pumpkin and sweet potatoes. Every time I've made it since I've done something a little different--used acorn squash instead of pumpkin, substituted ground ginger for fresh ginger or fried shallots instead of fresh shallots--and it still comes out great. There's just something so warm and cozy about this combination of flavors and colors. I like to save the pumpkin seeds and roast them with some olive oil and Old Bay seasoning. They add a nice crunch if you add them as a topping to the soup but are perfect for just snacking on, too. I also like the suggestion from The Kitchn of garnishing with chopped scallions, ichimi togarashi, and toasted sesame seeds. 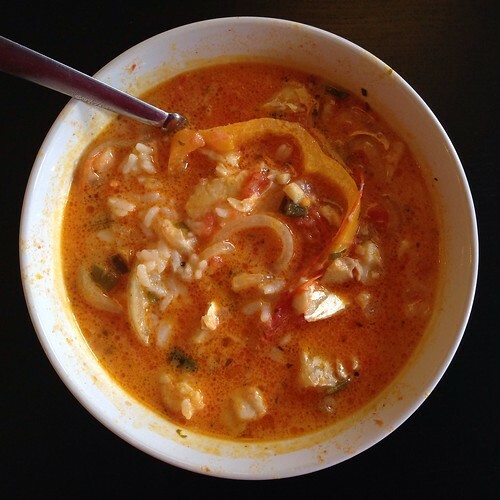 The red pepper flakes kick up the warming factor of the soup without being obnoxiously spicy. Cut the pumpkin or squash in half and remove the seeds and pulp with a metal spoon. Peel the pumpkin and cut into 2-inch pieces. Peel and cut the sweet potatoes into 2-inch pieces. Combine the pumpkin, sweet potatoes, and garlic on a baking sheet, toss with 2 tablespoons of olive oil, and sprinkle with salt and pepper. Roast in the oven until the pumpkin and sweet potatoes are tender when pierced, about 30 minutes, tossing halfway through. Add the fried shallots, ground ginger, miso, and vegetable stock to a large pot and stir until dissolved. Add the roasted vegetables and simmer for 15 minutes. Turn down the heat if necessary to avoid boiling, as this can impair the flavor of the miso. Puree the soup using an immersion blender. To serve, garnish with roasted pumpkin seeds or with chopped scallions, ichimi togarashi, and toasted sesame seeds. 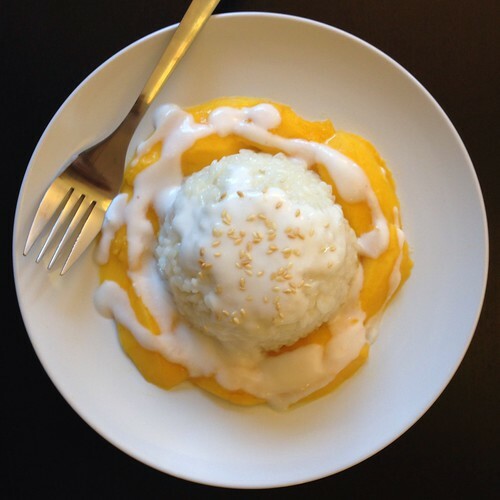 Trader Joe's used to carry this dessert, and I loved it: chewy sticky rice infused with coconut milk and topped with mangoes and even more coconut goodness. It had the sweet and salty flavor profile that makes you keep coming back for bite after bite. I've been missing this dessert ever since it was discontinued, but when I saw that mangoes were on sale at my local grocery store, I decided to learn how to make it myself. I followed this recipe from The Kitchn, but since I didn't have a steamer basket, I improvised with some parchment paper and the pasta strainer insert for my stock pot. You could also maybe try using cheesecloth with a metal colander or strainer in a large enough pot with a lid--anything with holes in which you could steam the rice in. I also suggest chilling the can of coconut milk in the fridge before opening because I find that it makes it easier to scoop the coconut cream from the top off if it's more solid. 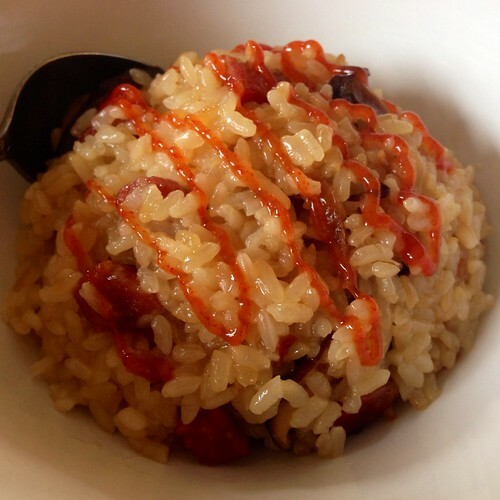 Soak the sweet rice in room temperature water for 1-2 hours. Cut a piece of parchment paper out about 3 inches wider in diameter than the bottom of the pasta strainer insert for a stockpot. Tuck the paper into the insert so it fits in the bottom like a bowl. Drain the rice and rinse thoroughly. Pour about 1 cup of water into the stockpot and place the rice in the parchment paper "bowl" and place the pasta strainer insert in the pot. Cover tightly and steam over low to medium heat for 20 minutes. While the rice is steaming, open the can of coconut milk and spoon out the thick cream on top into a small bowl. Pour the thinner, lighter coconut milk left in the can into a small saucepan. Stir in 2 tablespoons of sugar and 3/4 teaspoon salt. Warm over medium heat, stirring frequently, for 5 minutes. Do not let the sauce boil. When the rice is done, transfer it to a mixing bowl (it will be clumpy). Slowly pour the warm coconut milk over the rice in the bowl, stirring frequently. You want the milk to coat the rice but not leave puddles. Keep stirring, and stop pouring in coconut milk when it looks like the rice is saturated. You may not use all of the milk. Set the rice aside to finish absorbing the coconut milk; after 15 minutes or so it should have soaked up any milk that is still liquid. While the rice is standing, make the coconut topping sauce. Rinse out the coconut milk saucepan and pour in the coconut cream that you took off the top of the can. Stir in 1 tablespoon of sugar and 1/4 teaspoon salt. 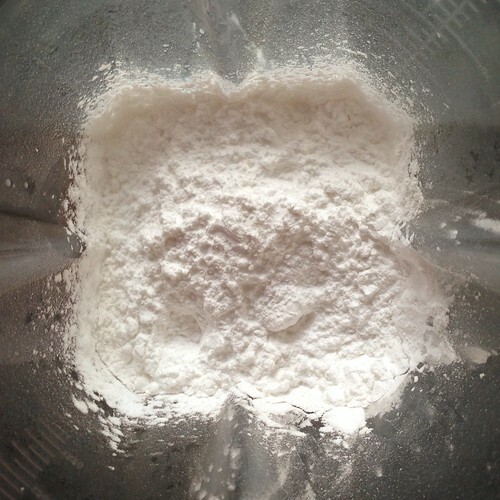 In a separate bowl, whisk together a few teaspoons of water and the cornstarch. Whisk this cornstarch slurry into the coconut cream and cook over low heat for about 3 minutes, or until the mixture thickens considerably. Set aside. Peel the mangoes and then slice the flesh into 1 inch wide strips. 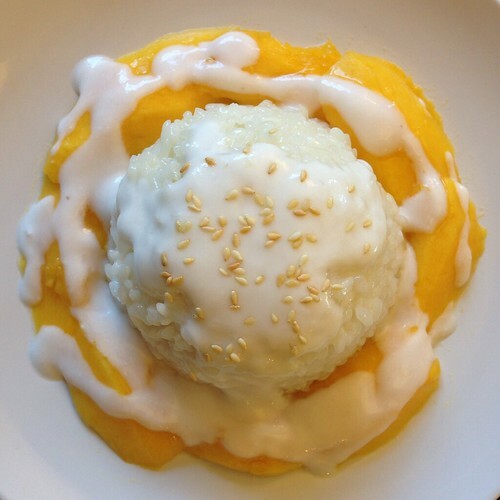 To serve, place about 1/3 cup cooked sticky rice on each plate, and arrange mango slices around it. Drizzle with the coconut topping sauce and sprinkle with a few toasted sesame seeds. I was going to a vegetarian Thanksgivingukkah potluck, and I knew exactly what I wanted to bring. I've been wanting to make this dish ever since I read the HuffPost Taste's article raving about it last year. 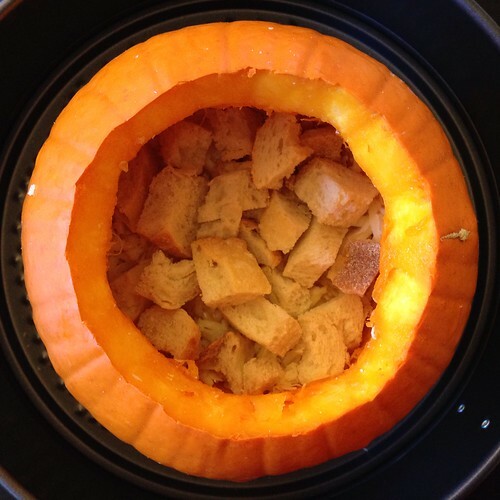 It's basically a pumpkin hollowed out and stuffed with breadcrumbs, cheese, and heavy cream, then roasted until the pumpkin is soft and scoopable and the filling is hot and bubbly. The original recipe from Gourmet calls for a 7 lb. pumpkin, but the only pumpkin I was able to buy so late in the season was as an add-on order from Boston Organics, and it was only 3.5 lbs. So I adapted the recipe a bit with the help of Dorie Greenspan's version and one of the reviews from the Gourmet recipe which suggested drizzling honey throughout the layers. I stuck with the Gruyère and Emmental cheeses from the original recipe this time, but in the future, I think it'd be fine to use some cheeses that you don't need to go to Whole Foods to find, like regular Swiss or Brie. To serve, I just used a large spoon to scoop out some of the filling and then scrape some of the pumpkin meat onto my plate. You can also scrape all the pumpkin into the filling and mix it all up before serving or just cut the pumpkin into wedges and plate it that way. 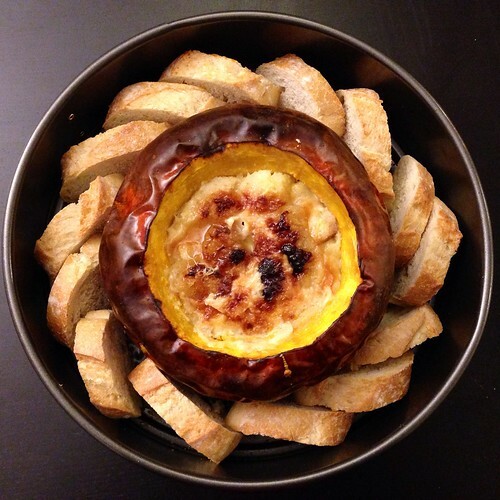 Either way, serve the pumpkin with some extra baguette slices and maybe extra honey. And make sure you save the pumpkin seeds to roast with olive oil and Old Bay seasoning! Preheat oven to 450°F with rack in lower third. Slice the baguette into 1/2 inch slices. Cut half of them into 1/2 inch cubes. 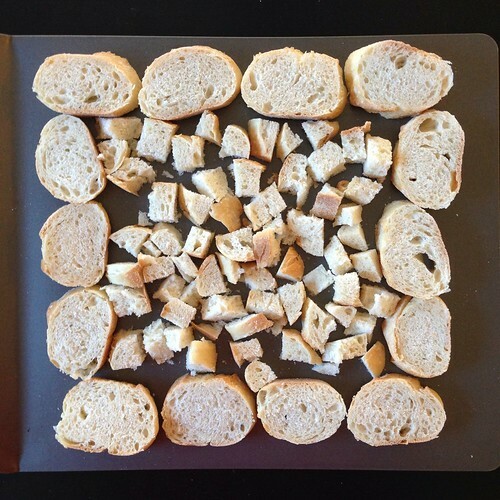 Toast the baguette slices and cubes in a single layer on a baking sheet in oven until tops are crisp (bread will still be pale), about 7 minutes. Transfer to a rack to cool. 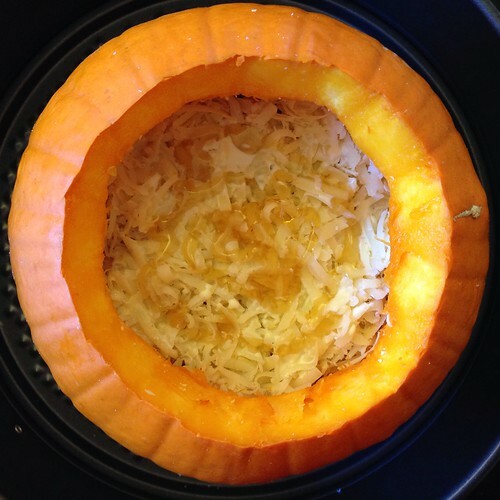 Remove top of pumpkin by cutting a circle around the stem with a small sharp knife. 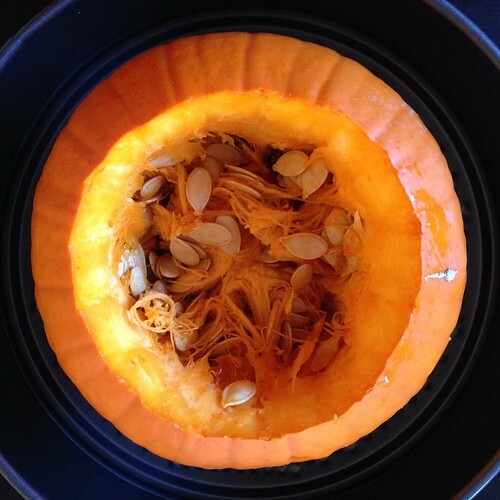 Scrape out seeds and any loose fibers from inside pumpkin with a spoon (including top of pumpkin; reserve seeds for another use if desired). Season the inside with 1/4 teaspoon salt and a drizzle of honey. Whisk together cream, nutmeg, 1/2 teaspoon salt, and 1/4 teaspoon pepper in a bowl. 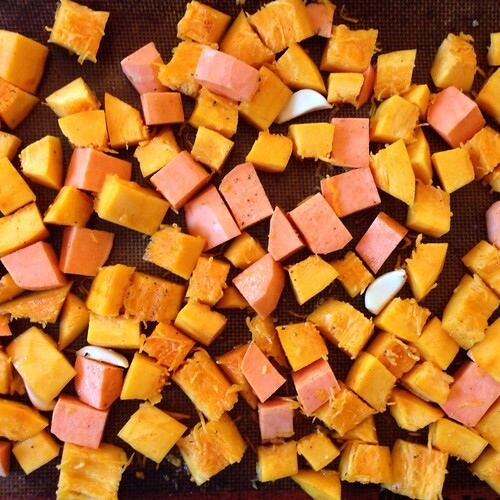 Mix together cheeses in another bowl. 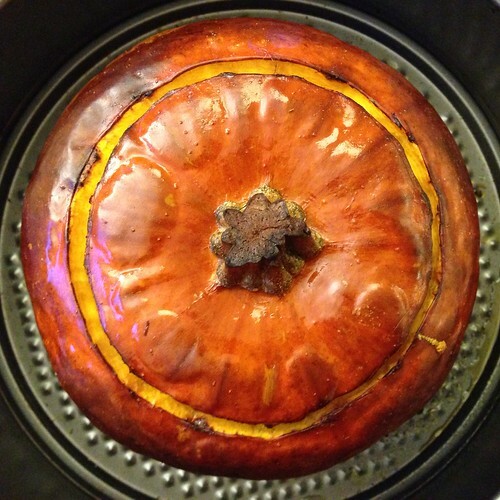 Cover pumpkin with top and put in an oiled small roasting pan. Brush outside of pumpkin all over with olive oil. Bake 1 hour and then remove the top. 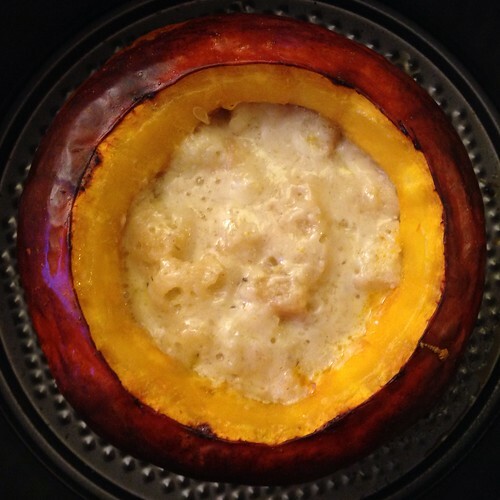 Return the rest of the pumpkin to the oven and bake until the top of the cheese is browned and bubbly, about 10 - 15 minutes. Serve with the rest of the baguette slices. I honestly thought I had already shared this recipe with you all, but when I looked it up recently I realized I had just posted a teaser post. How naughty of me! This is one of those recipes that is way more simple to make than you would think considering how delicious the end result it. And since it's made on the stovetop, it would make a great turkey substitute if you're thinking of going for an Asian-inspired Thanksgiving meal. I would serve it with sticky rice (instead of stuffing), Taiwanese rice cake with meat sauce (instead of mashed potatoes and gravy), steamed scallion buns or scallion pancakes (instead of dinner rolls), and some stir-fried fresh green beans (instead of a green bean casserole). Is anyone else hungry yet? Add all the ingredients to a pot large enough to hold the duck. Fill the empty beer can with water and add to the pot. Heat on high until boiling, then reduce heat to medium-low and cover. 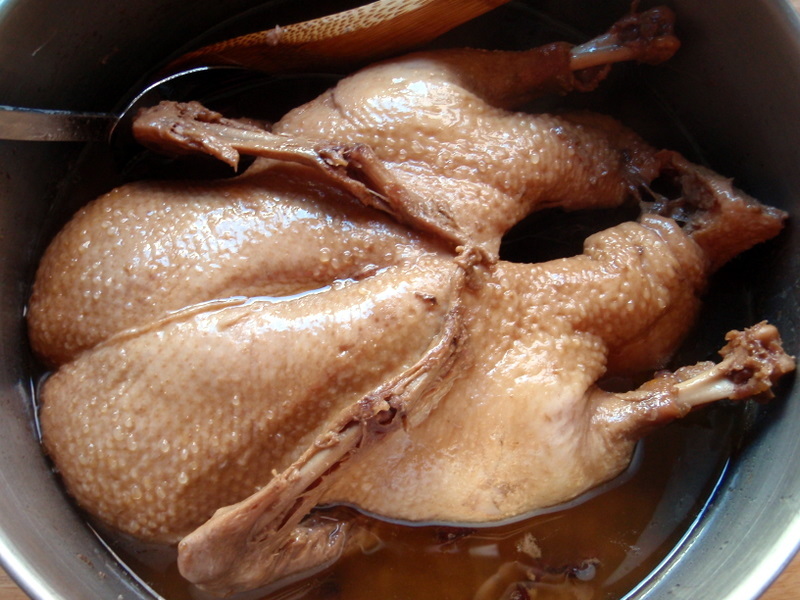 Turn the duck over every half hour until done (2 to 2 1/2 hours). 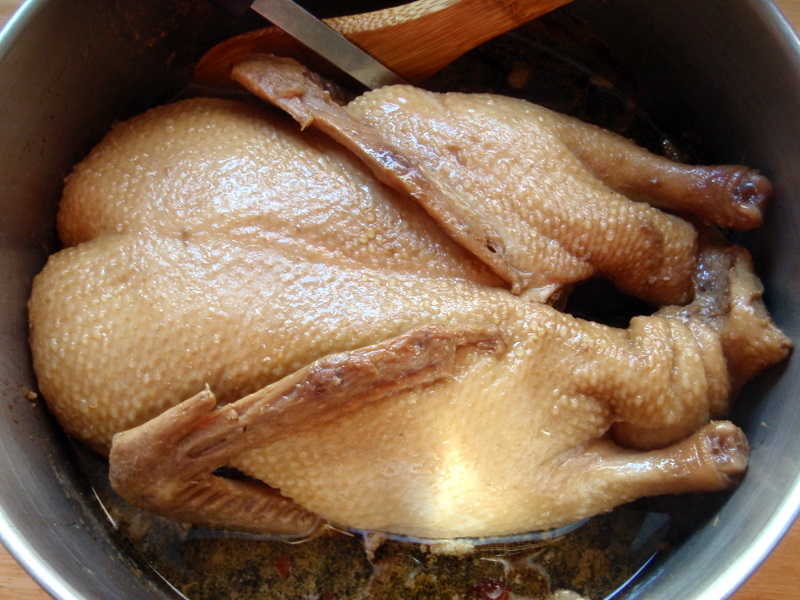 Cook uncovered the last half hour so the duck get s a nice brown, shiny coat. Serve with the braising sauce over steamed rice. 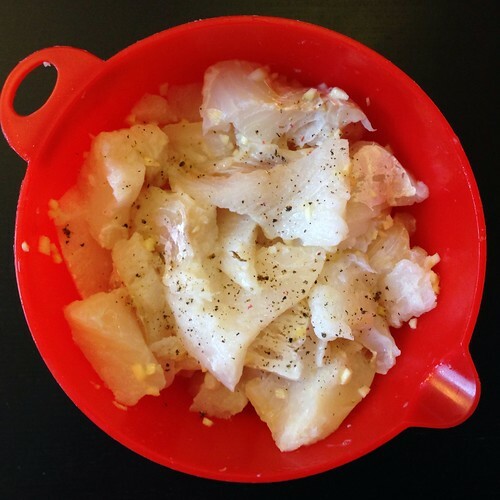 Save the duck fat for duck fat potatoes! One of the reasons I started this blog 5 years ago was to document and share my mom's amazing Taiwanese cooking. Since then, I've gone on to post a lot of different recipes, but hers are still my favorite ones because they remind me of home. The other day I was craving some of her sticky rice and called her up to ask for the recipe. This is how awesome my mom is: she was able to tell me how to make it right then and there without looking anything up! She was excited to share this new technique she developed where she first par-cooks the sweet rice and then bakes it off in a casserole dish instead of using a rice cooker. 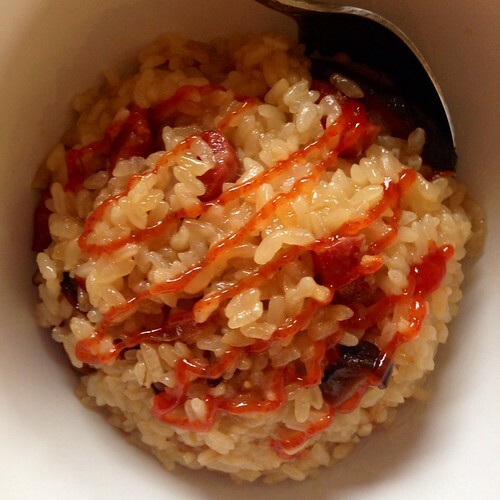 Apparently when using a rice cooker sometimes the sticky rice can get too mushy but when using this technique it's always "QQ", or chewy. Instead of cooking the aromatics in a different pan and then transferring everything into a casserole dish, I just used my Dutch oven (don't know how I lived without this baby!) If you don't have one, just transfer the rice to a casserole dish with a lid, or do what my mom does and just cover it with aluminum foil. My mom usually makes this with pork or chicken, but I decided to make it with Chinese sausage (which I guess makes it more Cantonese than Taiwanese). You can find the Chinese sausage and fried shallots (sometimes labelled fried red onions) in a Chinese grocery store. If you like cilantro, it makes a great topping, but if you don't, it still tastes great without it. For a little kick, I highly recommend serving it with some sweet chili sauce. 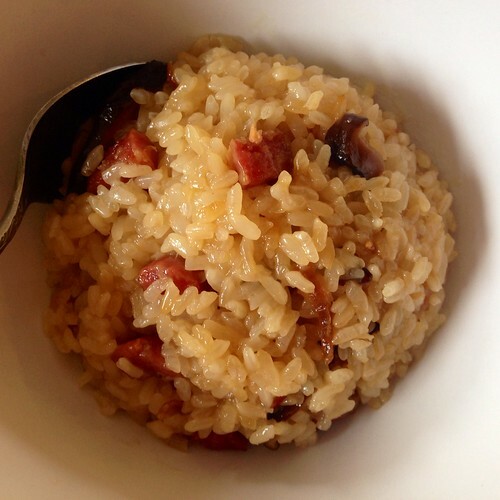 Soak the sweet rice and mushrooms in room temperature water for an hour. The mushrooms will float so place a lid or dish on top to weigh them down. Preheat the oven to 350°F. Start boiling 4 cups of water in a large pot. Squeeze the water out of the mushrooms and cut off the stems. Slice the mushroom caps and set aside. Drain the rice and add to the boiling water. Make sure that the water covers the rice, adding more water if needed. Cook for about 5 minutes, stirring frequently, until almost all the water is absorbed. The rice will have plumped but won't be soft yet. In the meantime, heat up the oil in a Dutch oven over medium heat. Add the sausage and cook for a few minutes until the fat is rendered out but before it browns. Add the mushroom and fried shallots and stir fry for about a minute or two. 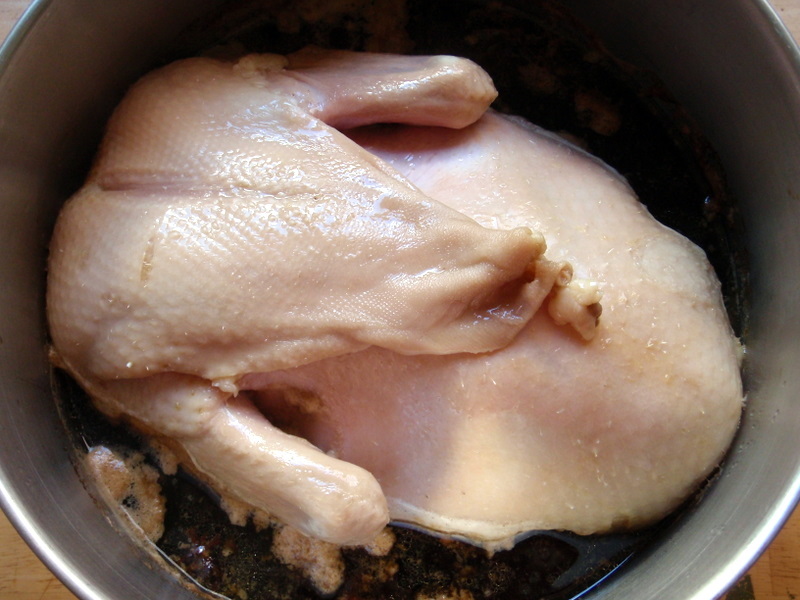 Add the rice wine, sugar, soy sauce, and sesame oil and mix well. Add the rice to the Dutch oven. Mix very well so that the rice is the same color throughout. Cover and bake for 20 minutes. Fluff and serve with cilantro and sweet chili sauce, if desired. One of my favorite places to bring visitors to Boston is this Afghan restaurant in Cambridge called The Helmand. Usually, it's the first time any of them have had Afghan food, and I love introducing them to the signature appetizer there, the kaddo. It's a "pan-fried then baked baby pumpkin seasoned with sugar and served on yogurt garlic sauce, topped with ground beef sauce." It sounds like a pretty strange flavor combination and is unlike anything else I've ever tasted, but it's absolutely delicious. I've had kaddo at another Afghan restaurant before, and it was definitely less sweet, so my guess is that the version served at The Helmand has been "Americanized". 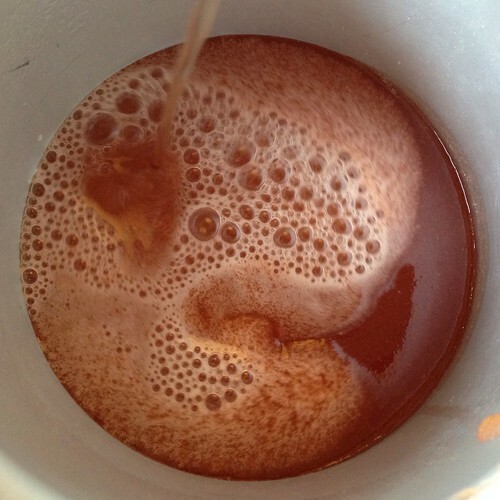 I found this recipe on Chowhound that gives a range for the amount of sugar to add and also suggests a vegetarian version. I didn't add the dried mint to the yogurt sauce because I didn't have any, and I reduced the amount of onions for the tomato sauce. Despite the changes, I was really impressed with how close this recipe is to what they serve at The Helmand. Cut the pumpkin into quarters. Remove seeds and strings, peel the skin with a vegetable peeler, and cut down into about 2-inch chunks. Heat 2 tablespoons oil in a dutch oven. Brown the pumpkin pieces, turning frequently, until golden brown. Mix sugar and cinnamon and sprinkle over pumpkin. Cover and bake for 30 minutes, or until tender. Mix together yogurt with the mint (if using) and crushed garlic in a bowl; season to taste with salt and pepper. In a medium saucepan, heat 2 tablespoons of oil and cook the onions until lightly browned. Add the garlic, coriander, turmeric, salt, and pepper. Mix well and cook until the spices are toasted and fragrant. 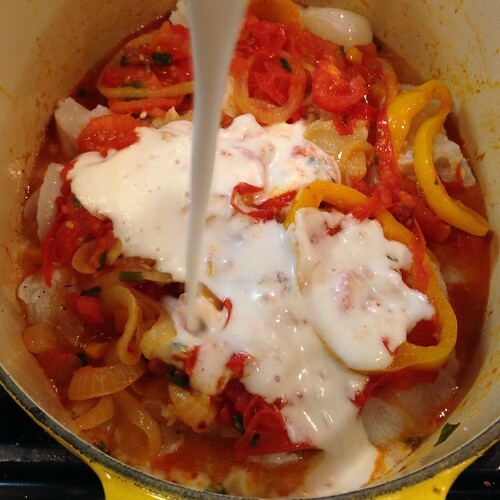 Add tomato sauce and water, mix thoroughly and bring to a simmer. Lower heat and cook about 20 minutes until it cooks down to a thick sauce. 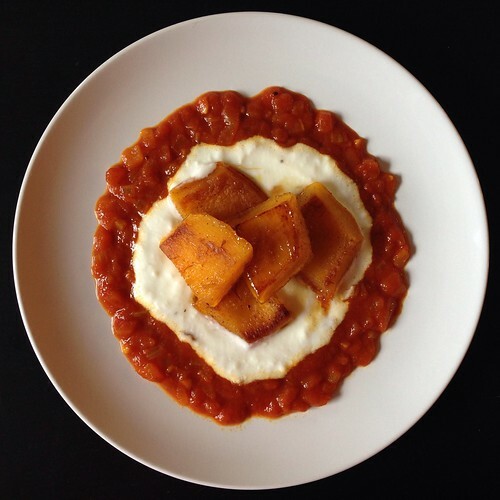 Serve the pumpkin with the yogurt and tomato sauces. 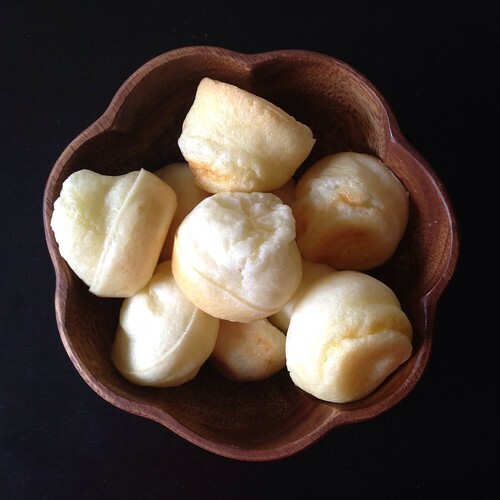 If you're looking for something to serve with moqueca, may I suggest pão de queijo? 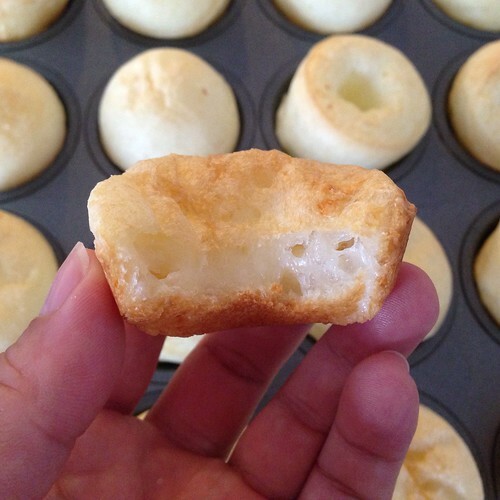 These Brazilian cheese buns are soooo good and easy to make! They kind of remind me of a savory mochi in that there's a chewiness from the tapioca flour but end up being more light and airy than dense. The first time I made this recipe from Simply Recipes, I made the mistake of dumping the tapioca flour in my blender before adding all the liquids. When it came time to turn on the Vitamix, nothing happened. At first I was afraid the blender was broken but after digging around in there, I realize the blade just couldn't move around in the cement-like tapioca flour. I ended up dumping everything into a mixing bowl and whisking it by hand, which worked out fine. But if you'd like to make it in the blender, please learn from my mistake and put the tapioca flour in last. I was able to find a soft farmer's cheese at my grocery store, but I've also read other recipes that use parmesan and cheddar cheeses, so you can probably use any cheese you like. The first batch I made had a way too strong olive oil flavor, so in the second batch I cut the oil with some canola, and it turned out a lot better, in my opinion. Preheat oven to 400°F. 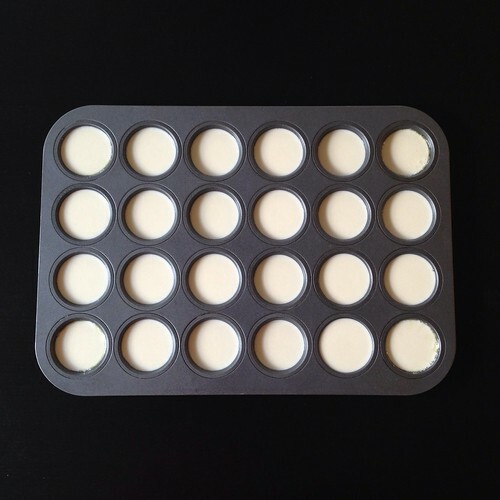 Grease a mini-muffin tin. Put all of the ingredients into a blender (tapioca flour last) and pulse until smooth. You may need to use a spatula to scrape down the sides of the blender so that everything gets blended well. At this point you can store the batter in the refrigerator for up to a week. 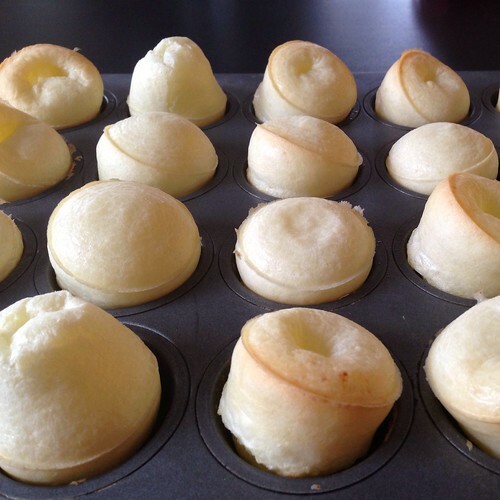 Fill the mini-muffin tin wells until almost full. 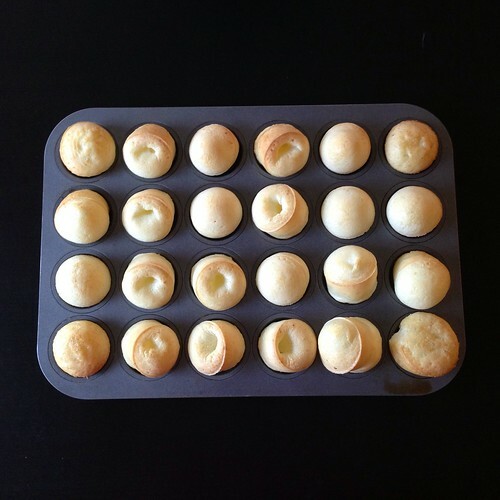 The buns will puff a lot in the oven but then shrink a lot upon cooling. Eat while warm or save to reheat later. 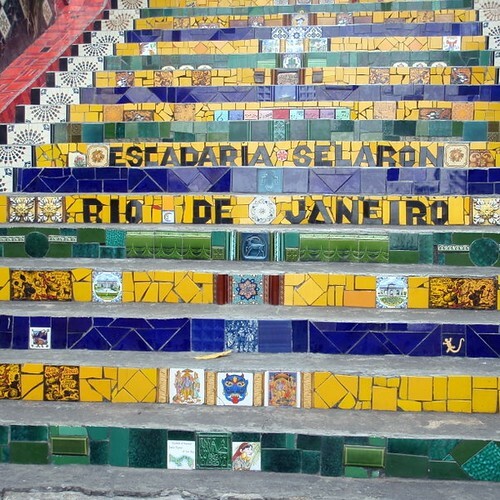 A few years ago, I visited Rio de Janeiro with my friend Ellen, a fellow foodie. Our second night there, we had planned to walk from our hotel in Copacabana to Azul Arinho, a restaurant on Ipanema known for their moqueca. Along the way, we found a cute gelato shop, Beijo Carioca, and, upon realizing that they would be closed by the time we would be done with dinner, we had to stop and get a pre-dinner treat. The gelato was so good that on our last day in Rio, with only an hour left before we had to head to the airport, we made a mad dash back for a last taste of paradise. Continuing on to dinner, we passed by a Koni Store, and since I had read about this trendy new restaurant, we just had to stop and try a salmon hand roll. Then there was the churro cart around the corner...but we decided that we absolutely could not eat anything else before we got to dinner (and hoped that the churro cart would still be there on the way home). Despite not being the last bit hungry due to all the pre-dinner snacking, I found myself absolutely loving the moqueca. We got ours Bahian style, which means it's cooked with coconut milk, palm oil, and cilantro and served with white rice, pirão (a gravy made from fish broth and cassava flour), and dendê farofa (cassava flour cooked in palm oil). 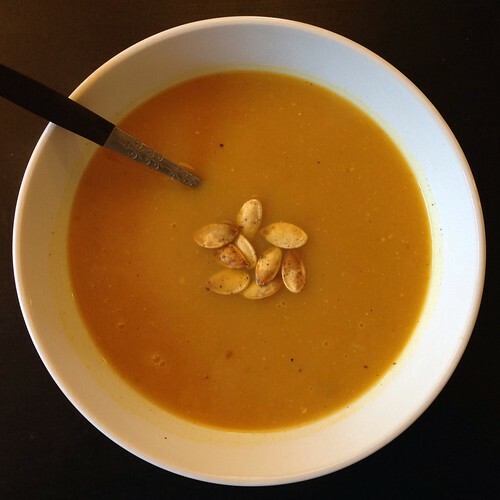 I haven't been able to find palm oil, but this recipe from The Perfect Pantry uses annatto seeds simmered in canola oil to make a similarly bright orange oil. If you can't find annatto seeds, you can just use sweet paprika instead. When a recipe calls for adding salt at the end to taste, I've started using adobo seasoning instead of just plain salt, especially for Latin-inspired dishes, for even more flavor. Other than that I pretty much followed this recipe from Simply Recipes to make the rice and stew. I've made the stew with haddock and cod and had a slight preference for the haddock version. I can only imagine how good it would taste with sea bass instead. 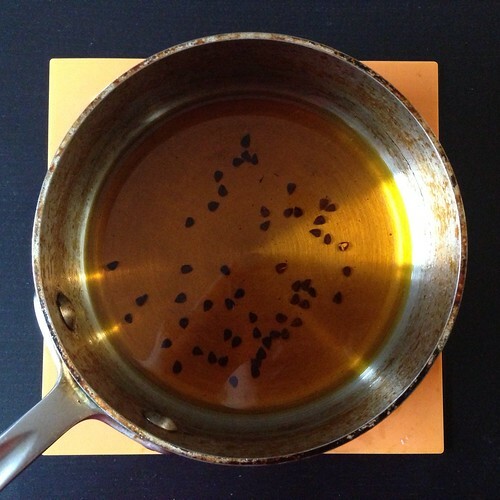 In a small saucepan, combine the annatto seeds and canola oil. Cook over medium heat for 10 minutes, until the oil turns orange. Remove from heat, strain out the seeds (and discard), and set the oil aside to cool. This can be done far in advance. To make the rice, heat one tablespoon of olive oil in a medium saucepan on medium high heat. Add the chopped 1/2 onion and cook, stirring, until the onion is translucent. Add the garlic and cook for 30 seconds more, until the garlic is fragrant. 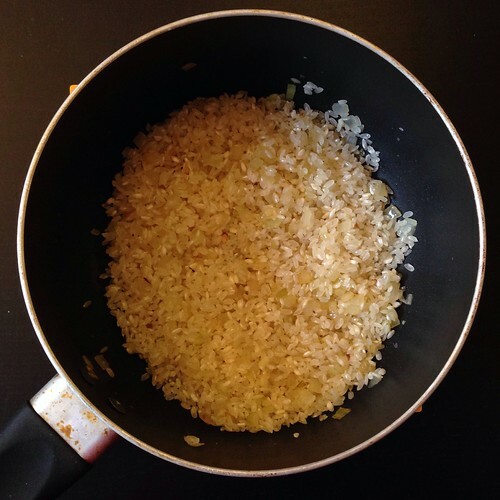 Add the raw white rice and salt and stir to coat completely with the oil, onions, and garlic. Transfer to a rice cooker and add the recommended amount of water (mine uses 2 cups water for 1 1/2 cups of rice). Cook the rice in the rice cooker while you make the stew. Place the fish in a bowl and add the minced garlic and lime juice so that the pieces are well coated. Sprinkle generously all over with salt and pepper. Keep chilled while preparing the rest of the soup. In a large covered pan (such as a Dutch oven), coat the bottom with about 2 tablespoons of olive oil and heat on medium heat. Add the onion and cook a few minutes until softened. Add the bell pepper, paprika (if using), and red pepper flakes. Sprinkle generously with salt and pepper. Cook for a few minutes longer, until the bell pepper begins to soften. Stir in the tomatoes and green onion. Bring to a simmer and cook for 5 minutes, uncovered. Stir in the chopped cilantro. Use a large spoon to remove about half of the vegetables (you'll put them right back in). Spread the remaining vegetables over the bottom of the pan to create a bed for the fish. Arrange the fish pieces on the vegetables. Sprinkle with salt and pepper. Then add back the previously removed vegetables, covering the fish. 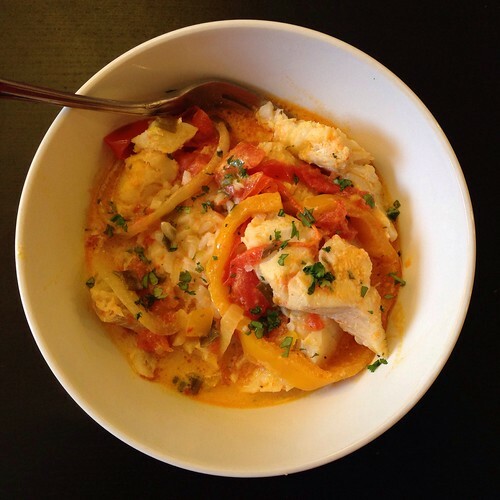 Pour the coconut milk and annatto oil over the fish and vegetables. 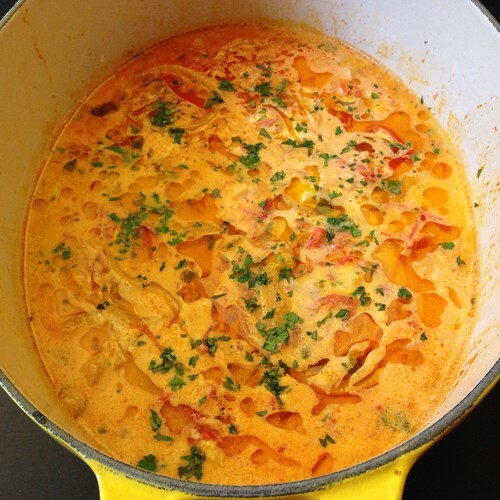 Bring soup to a simmer, reduce the heat, cover, and let simmer for 15 minutes. Taste and adjust seasonings. You may need to add more salt or adobo seasoning, lime juice, paprika, pepper, or chili flakes to get the soup to the desired seasoning for your taste. Garnish with cilantro and serve with the rice. I was actually pretty surprised at how close to the real thing this tasted considering how exotic the flavors are to me. As with most stews, this tastes even better the next day and the day after that, when the flavors have had a chance to meld together more. 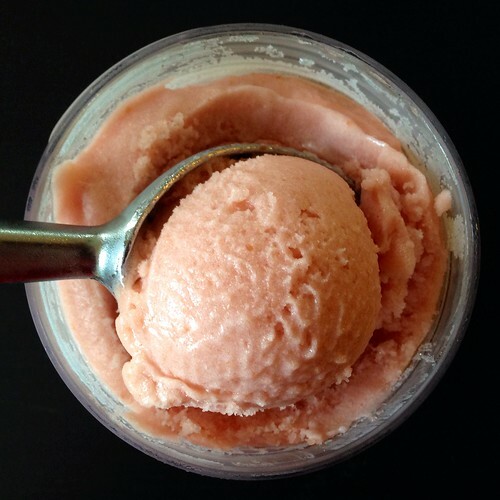 I've heard great things about Jeni's sour beer sorbets, but I never thought I'd make it myself if only because I didn't ever think I would come into possession of any lambic beer. 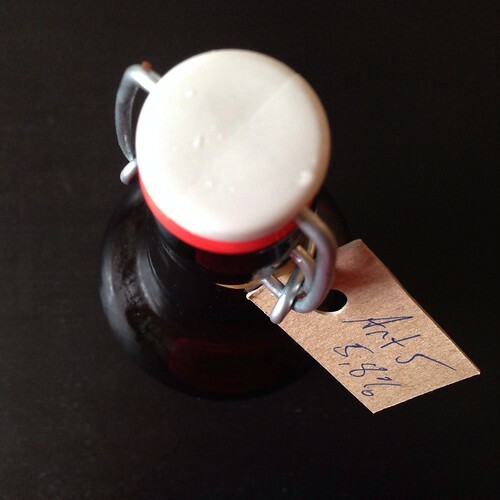 But then my roommate decided to break out her growler of Night Shift Brewing's Art #5, which happens to be an "experimental Berliner Weisse style sour ale aged on fresh raspberries [with] mint leaves added." After one sip I realized it would be perfect for a sorbet! For the fruit I used a couple of pluots from a recent Boston Organics delivery, but you can use any stone fruit: peaches, apricots, cherries, etc. 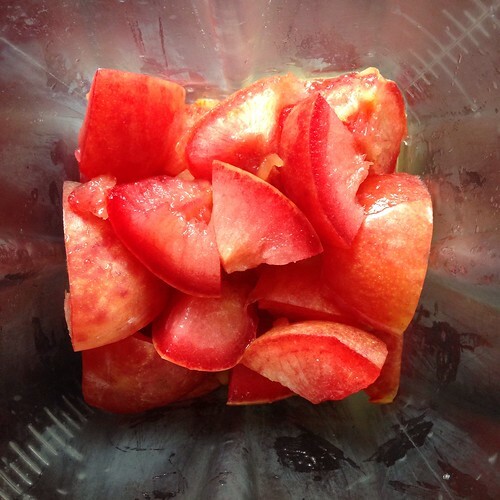 Remove the stones from the pluots and puree in a food processor or blender until smooth. Combine the pureed fruit, sugar, and corn syrup in a 3-quart saucepan and bring to a simmer, stirring to dissolve the sugar. Remove from the heat immediately and put in the refrigerator to chill for at least 2 hours. Strain through a sieve into a bowl. 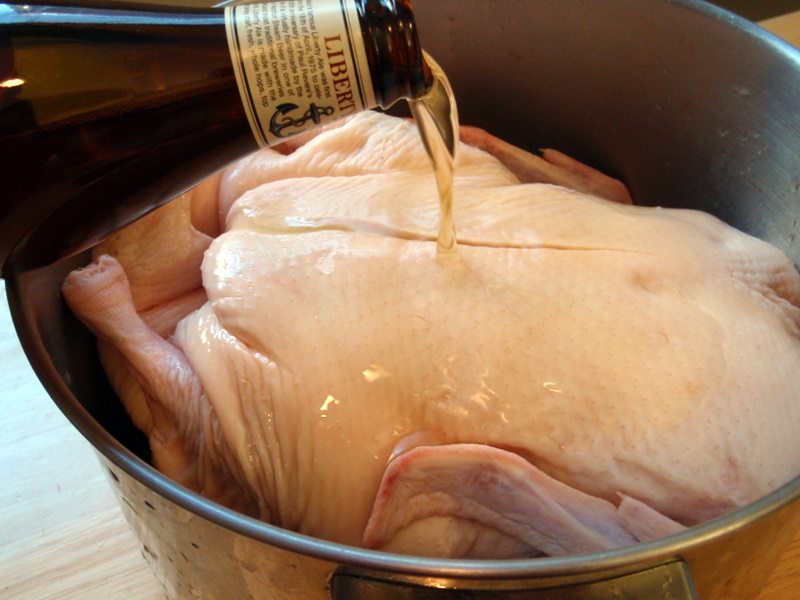 Add the beer and chill thoroughly. 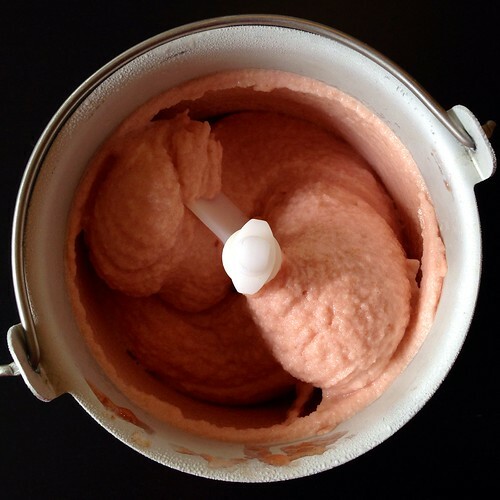 Pour the sorbet base into the frozen canister and spin just until it is the consistency of very softly whipped cream. 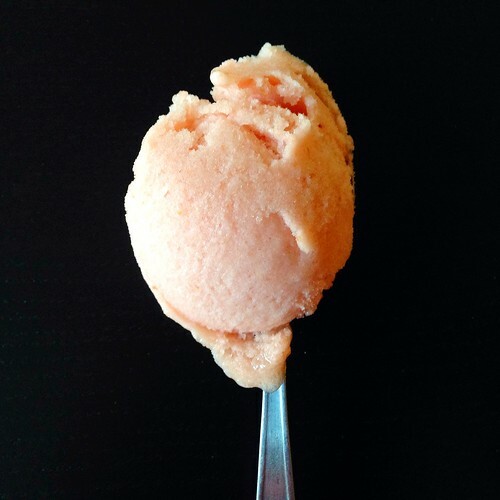 I was really surprised at how much I liked this sorbet considering I'm not a big fan of beer. The sweetness and sourness were perfectly balanced, and there was a nice malty finish to each bite. Oh Jeni, once again you have made a believer out of me.